This woman was displeased with her disproportionately large arms. 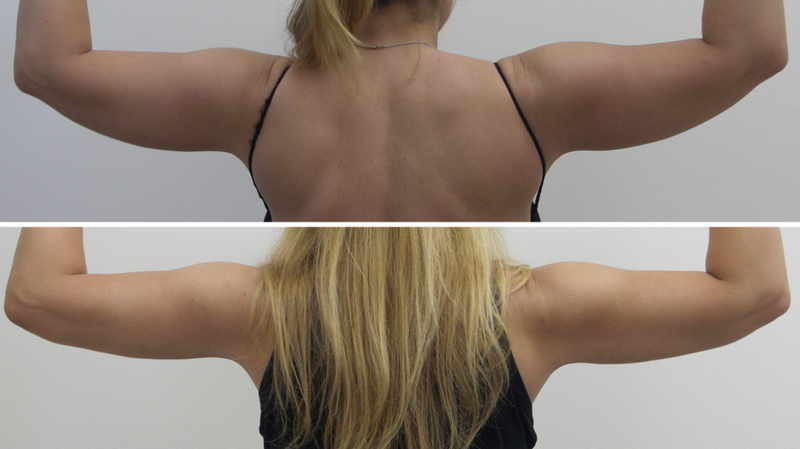 She was also unhappy with unevenness along the sides of her back from a previous liposuction done elsewhere when she was 10 pounds lighter. 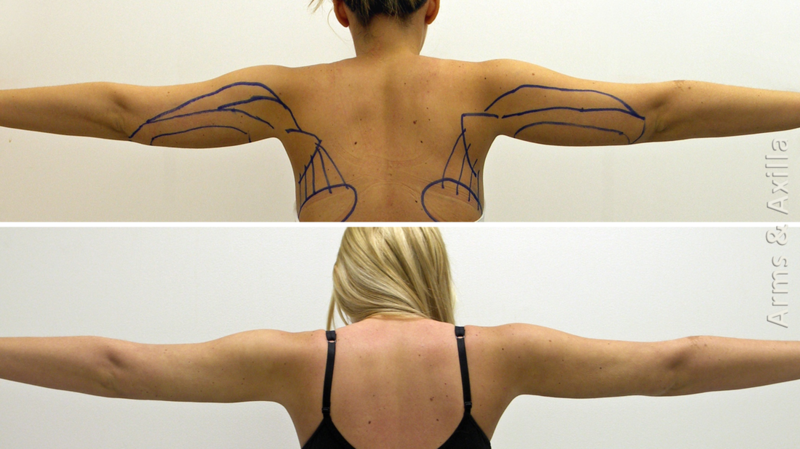 I designed the operation to create a natural flow of the contours from the axilla outward. Liposuction was extended beyond the elbow to give a natural appearance to the area. 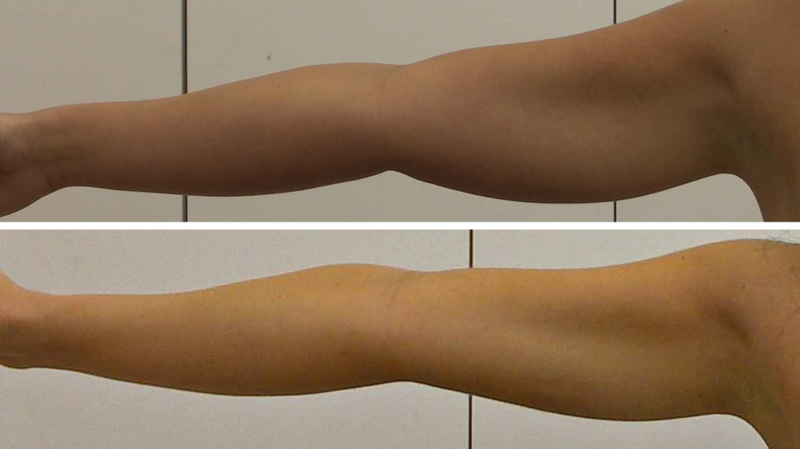 In addition, high definition muscle etching was used around the shoulder (deltoid muscle) to give a toned athletic appearance to the arm. After gaining then losing "baby fat", this woman displayed flabby loose excess upper arms fat. She also had excess fat along the sides of breasts which was made more prominent by breast implants.nter (Labial Tuck). 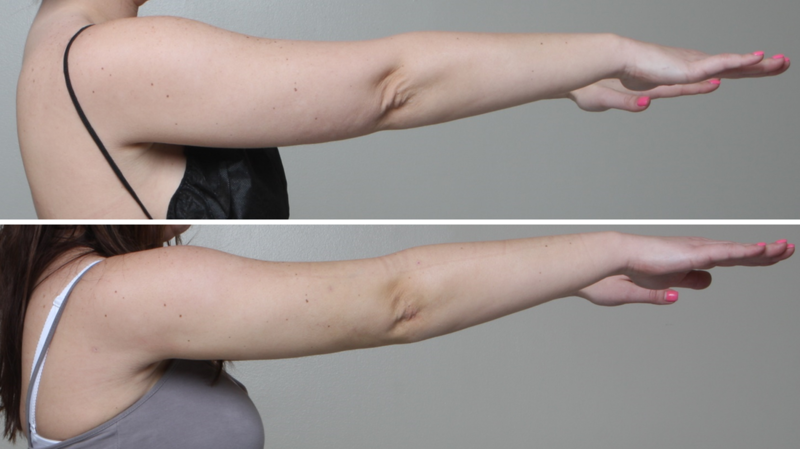 This woman had liposuction of the arms done elsewhere, but had a large amount of residual fat and requested repeat (revisionary) liposuction. 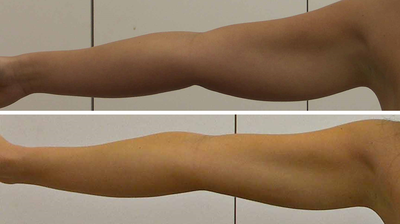 More than one pound of fat was removed from each arm to create a more desirable slender result. 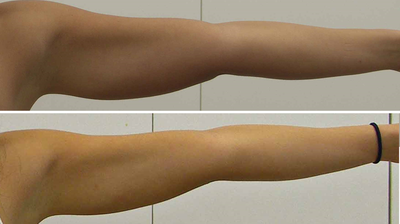 Thick fat deposits of the upper arm respond best to liposuction when the skin lacks stretch marks or wrinkles. In the first few days and weeks after the procedure, the skin will naturally shrink down leaving a smooth texture. Notice the toned appearance of the shoulder (deltoid) muscles. 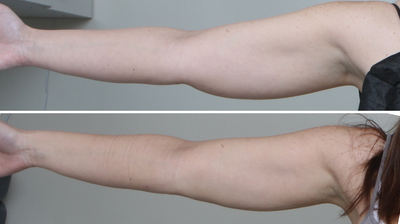 This athletic 29-year-old woman had significant fat deposits at the upper arms despite an otherwise lean build. 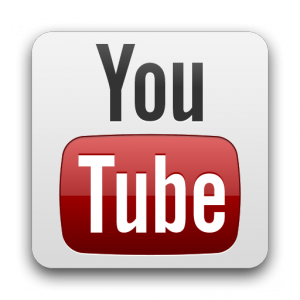 Many normal-weight women have similar fat collections and they tend to be resistant to diet and exercise, but respond well to liposuction.